"China is a country of nations: Fifty-five different minority groups inhabit a wide range of the country’s geography. For many of these groups, music is the way in which their cultural survival is ensured. While China’s capital may seem like a strange place for a Mongolian folk revival, Hanggai, a five-piece folk outfit composed of ethnic Mongolians, is captivating Beijing’s rock-heavy music scene with their brand of traditional Mongolian music with a contemporary feel. Traditional Mongolian music is based in the rhythms and sounds of horseback riding, wherein lie the roots of its culture. 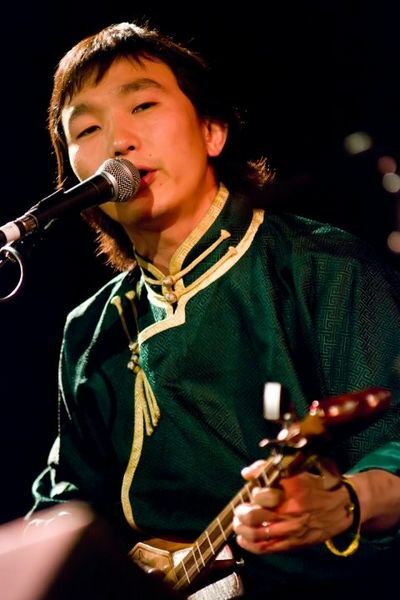 Hanggai combines primarily traditional instruments – the morin khuur, or horse-head fiddle, and the tobshuur (two-stringed lute) – with a throat singing technique (hoomei) that has been handed down over the course of more than two millennia and elicits the rolling plains of the Mongolian grasslands. Indeed, the band’s name is an ancient word that refers to a heavenly combination of the best of the Mongolian landscape – big blue skies, mountains, rivers, trees. A tasteful addition of modern flavour is the result of the group’s time in Beijing’s rock underground in a variety of bands and is balanced by their commitment to preserving the traditions of Mongolian music through regular musical pilgrimages to Inner Mongolia. Hanggai has been called “one of the more soulful groups in town” by one of Beijing’s major media outlets, and is leading the charge of a small collection of folk musicians bringing traditional music into the urban scene. The band has performed to audiences of thousands at the massive Gegentala Inner Mongolian Rock Festival (Aug 05) and at Beijing’s Midi Music Festival (Oct 05); in support of (and in jam sessions with) Norwegian group Poing and Nettwerk Records folk artist Abigail Washburn’s November 2005 tour of China; and in venues around the country. The group’s self-produced and self-distributed release is a surprising listen: Recorded primarily with one microphone, its sales – only off the stage at Hanggai shows – represent a desire on behalf of Beijing audiences for a return to the roots. Linking ancient Mongolian musical traditions with their contemporary urban living experience, Hanggai is trying to create a unique sound of the ethnic Mongolian people in China." 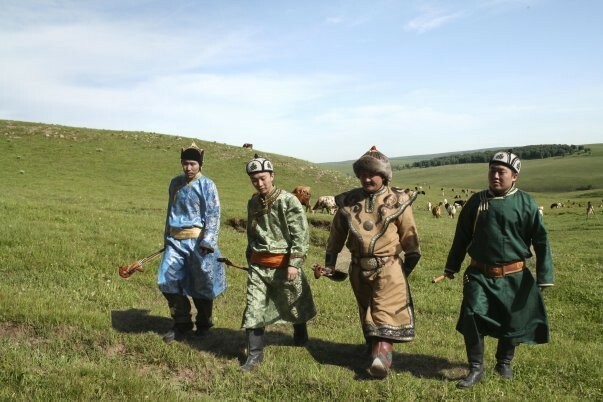 "The Mongolian grasslands' answer to The Pogues"
"Let our song never end / Let our fortunes never decline / A cup forever in our hands / A song forever in our throats." As band mottos go, no-one could disagree that the philosophy of Chinese six-piece Hanggai, as taken from their excellent Drinking Song, draws from the very essence of the musical life, from hoary old folk singers to leather-clad rock'n'rollers. 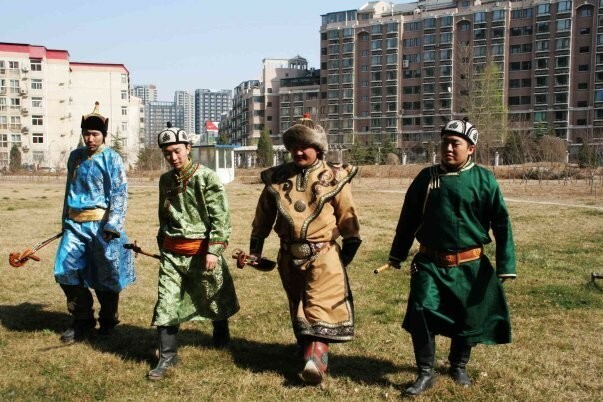 Although hailing from downtown Beijing, Hanggai have metaphorically moved out of both the city and the 21st century in their embrace of the hills-old folk songs of the Mongolian grasslands. Their reinterpretations might make liberal use of traditional instruments like the morin khuur (a horse-hair fiddle) and the tobshuur, a local two-stringed lute, but they take the music as their own. "Hanggai Band is a folk music group from Beijing who specialize in a blend of Mongolian folk music and more modern styles such as punk rock. The band consists of Hurcha (vocals), Ilchi--the former frontman from a punk band-- (Tobshuur /two stringed lute), Hugejiltu (Morin Khuur – horse-head fiddle), Li Dan (Percussion), Xu Jingchen (guitar/banjo), and Wu Junde (bass). 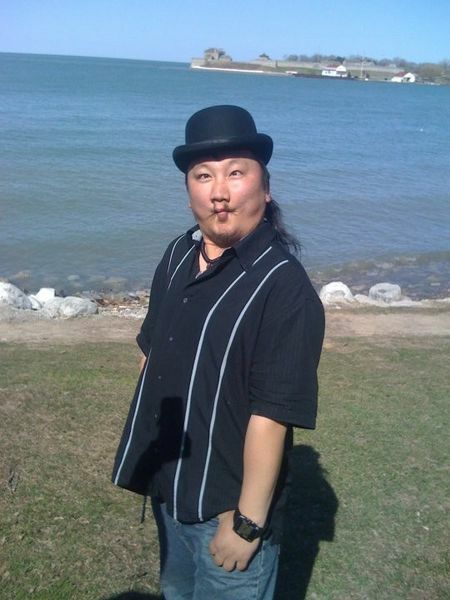 The members of Hanggai Band come from diverse backgrounds with singer Ilchi having once been the front man of punk band T9. 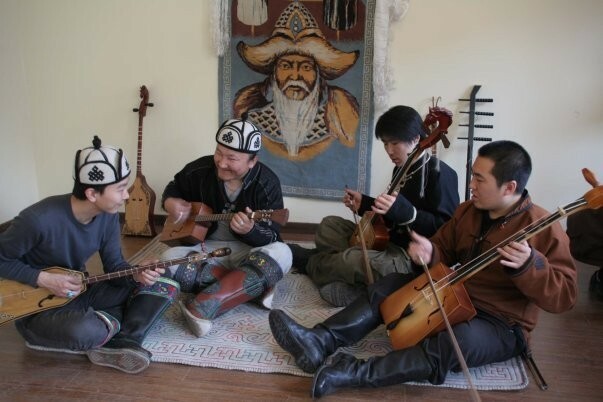 These eclectic experiences have come together to give Hanggai Band a particularly unique sound blending Mongolian folk music with more popular forms such as punk. In an interview with Spinner, Ilchi stated that amongst the group’s many influences, Western artists such as, “Pink Floyd, Radiohead, Rage Against the Machine, Secret Machines, Electralane and Neil Diamond…” have played a large role in shaping the band’s music. Indeed, although the core of their sound is based around the morin khuur and the tobushuur, two traditional instruments, the band also incorporates some much less traditional fare. In their first album, Introducing Hanggai, the band also made heavy use of electric guitars, computer programming, bass, and banjoes in order create a more seamless and modern sound. Footage from a tour in the United Kingdom in September 2008 also suggests that the band has not wandered too far from their punk roots as one even sees members of the audience head banging, a hallmark of punk culture, to the band’s music. 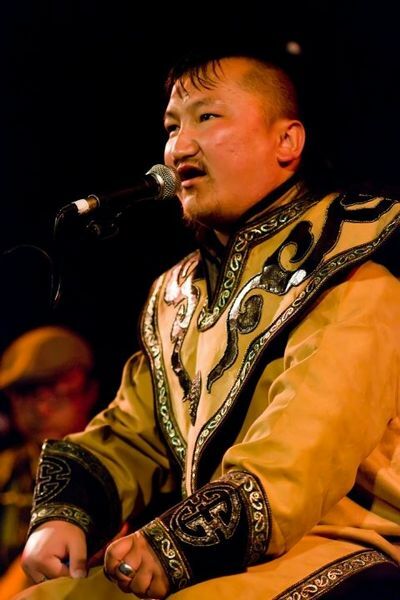 All the songs are adaptations of Mongolian folk songs and are sung in Mongolian incorporating throat singing, a Mongolian technique in which the artist emits two different pitches at the same time. 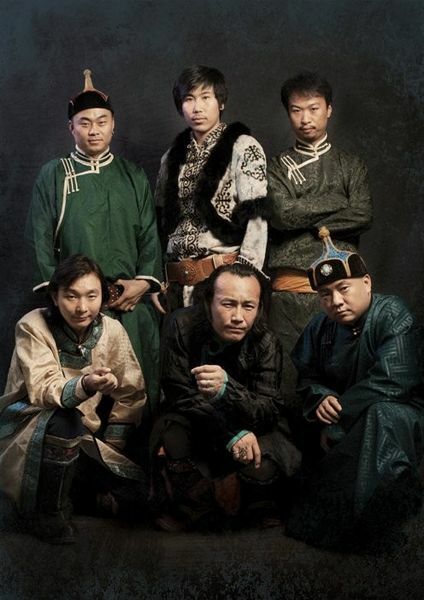 With this unique and eclectic mix, Hanggai Band seems to at times defy categorization often falling under the genre of “World Music” and even warranting the creation of their own unique genre: “China Grass”. Hanggai's first album - "Introducing . . ."